If you are the hunted, you are in the herd. It means whatever everyone else is doing, you are doing. You are chasing the market when everyone chases, you are panicking when everyone panics. You are the fear and greed that provides opportunity for the calculated. "Well ya see, Norm, it's like this... A herd of buffalo can only move as fast as the slowest buffalo. And when the herd is hunted, it is the slowest and weakest ones at the back that are killed first. This natural selection is good for the herd as a whole, because the general speed and health of the whole group keeps improving by the regular killing of the weakest members. "In much the same way, the human brain can only operate as fast as the slowest brain cells. Excessive intake of alcohol, as we know, kills brain cells. But naturally it attacks the slowest and weakest brain cells first. In this way, regular consumption of beer eli minates the weaker brain cells, making the brain a faster and more efficient machine. That's why you always feel smarter after a few beers." So just get in the middle of the herd right? Safe for the most part. You won’t be the straggler. 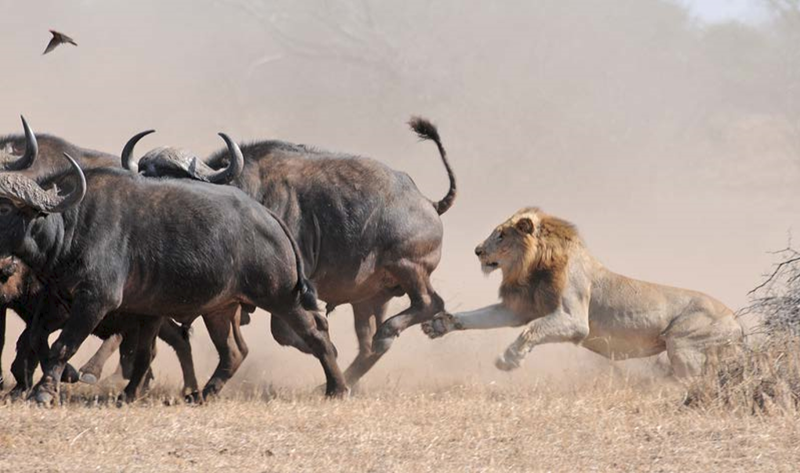 As an investor, you can just switch from the straggler back into the herd. Pretty simple. Except when there is a recession. Or a crisis. Or a bubble bursting. Then the whole herd “dies”. Well, not quite dies. But loses 20, 30 or even 50% of its value. But that’s ok right? Because everyone else did. Well it’s ok if you are a money manager, or asset accumulator as I prefer to say. Because the money won’t move elsewhere. But it is less than ok if you are an investor. The “smart” money knows this. The secret to building wealth is simple. Don’t lose money. That’s why wealthy individuals and families focus on absolute returns. Making money every year. Full stop. Not “making” money relative to a volatile benchmark. Ah, but you’re a “long term” investor right. And in the long term you simply have to own equities. Don’t worry about the odd little wobble. Just look at this chart. Over the long term, the stock market always goes up. You have to be careful if you have a 10 year horizon. 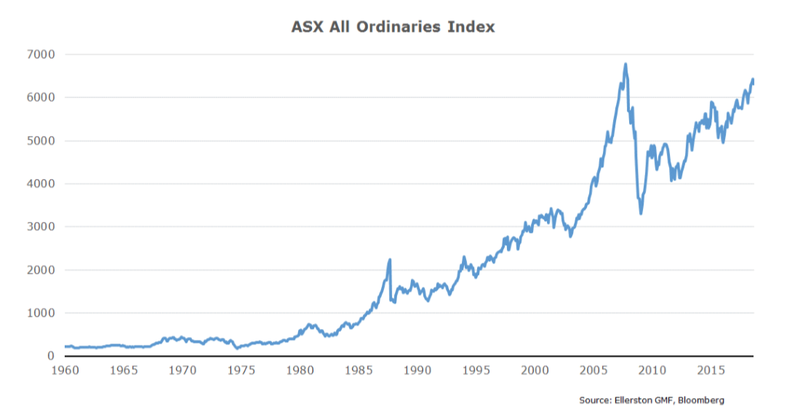 The chart below shows your return over 10 years buying and holding the Australian stock market. There are 6 periods in the last 50 years where your 10 year return was negative or close to. Are we within two years of a global (US) recession? Let’s take the second one first. The US stock market. 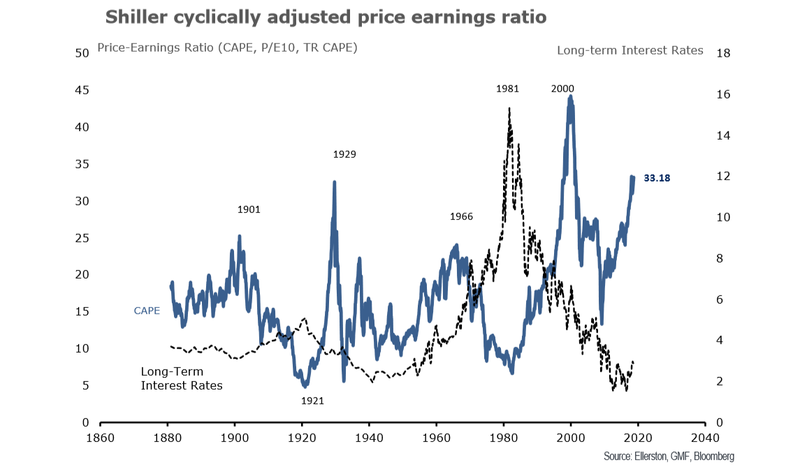 To be fair, we should look at the price/earnings ratio, or better still the cyclically adjusted price/earnings ratio (CAPE). So valuation is clearly high. Indeed, excluding the Dot Com bubble it is at historic highs. But this has been true for some time. How do you know if a correction is likely? 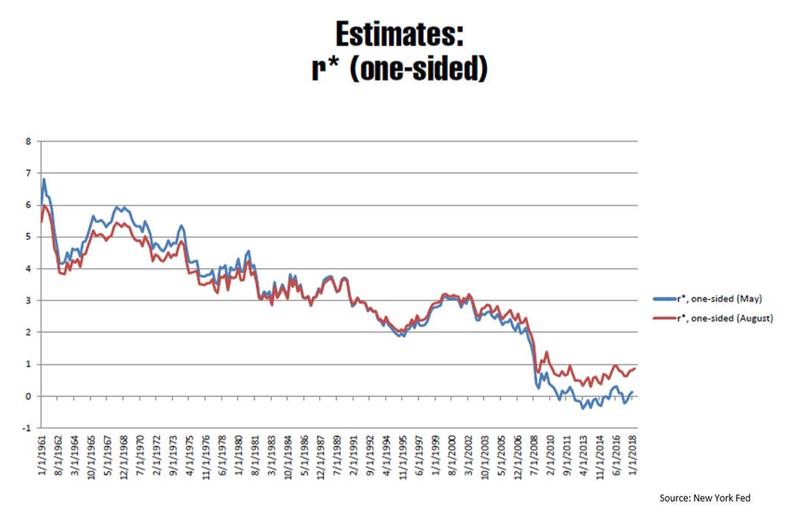 Obviously, the rate of change in the discount rate (bond yields) is the most direct risk. But equity markets can also correct as prices extend well beyond their own fundamentals. 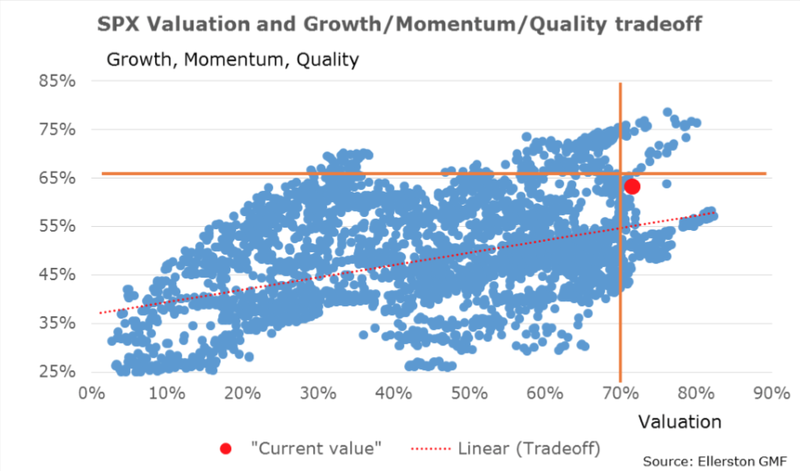 We screen the major equity markets in the world across 20 different quantitative factors to delineate what each market is paying for growth, momentum and quality. The chart below summarises the factors on a daily basis since 1980. Even on this more granular basis the US equity market is historically expensive. 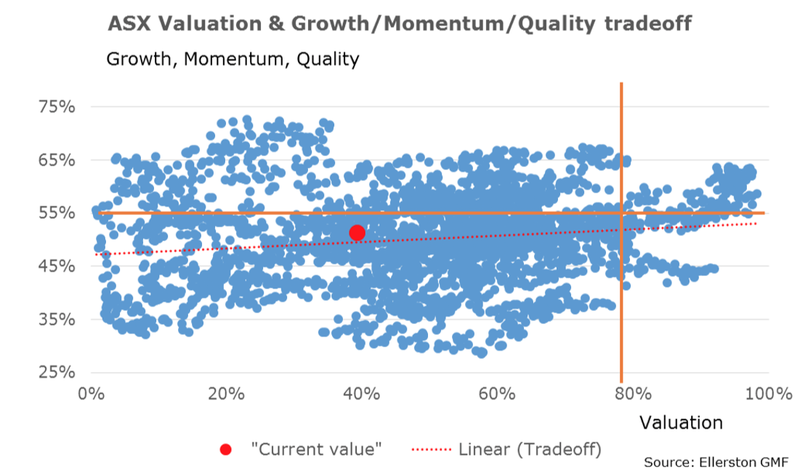 The same factor screen for the Australian equity market suggests that local valuations are relatively fairly valued. 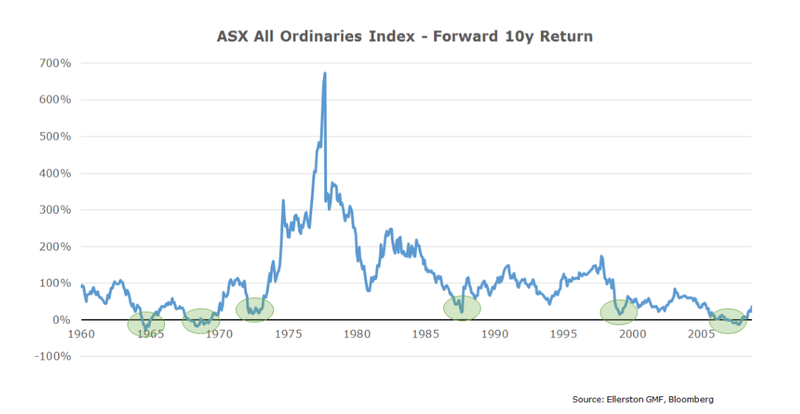 However, any correction in the US equity market will clearly reverberate around global equity markets, including Australia. 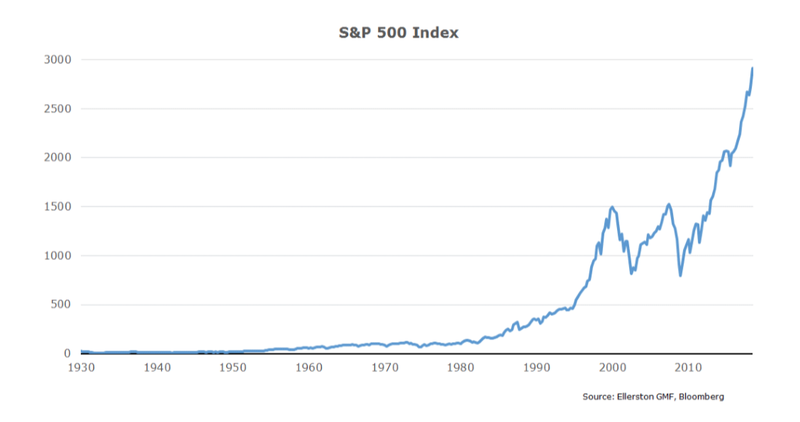 So we have a US stock market that has become expensive. But expensive alone doesn’t mean a fall is imminent. It does, however, mean the market is vulnerable. 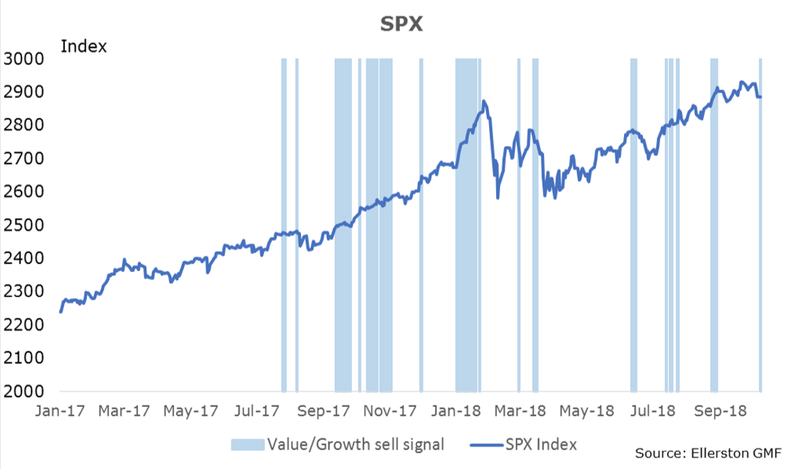 Indeed, when Tim convert’s his factor screens into whether the SPX is flagging a correction in coming weeks it is notable that we have now moved through the threshold that has been useful in identifying prior corrections. Are they about to rise materially? 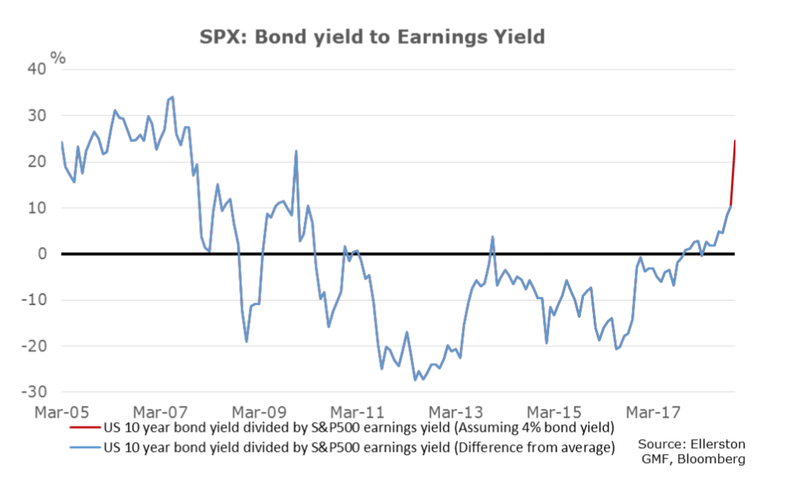 Last month, I outlined in detail why we thought bond yields in the US are about to rise. As I write (on the 7th October), the starter’s gun has fired for the bond vigilantes (though I suspect many didn’t hear it.) The US 10 year bond has finally broken the 2.8% to 3.1% range of the last 7 months. Your fund is off to a flying start for October, but let’s not count our chickens. We are more focussed on the break extending to our long held targets of 3.5% by year end and perhaps 4% next year. So why are we calling the starter’s gun? What has happened in the last month? US growth accelerated. 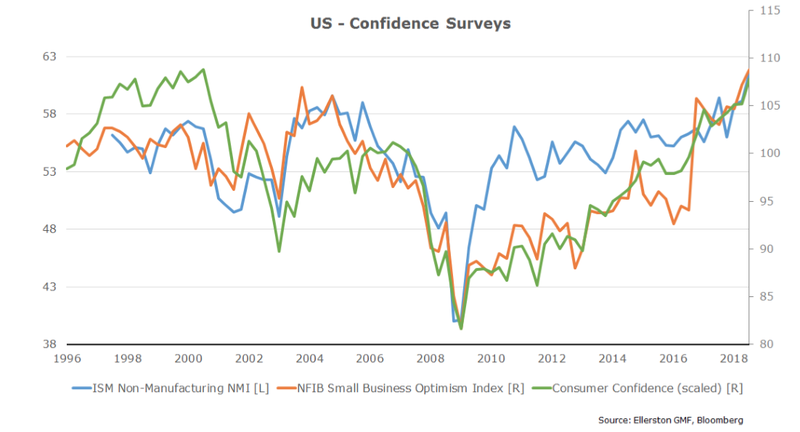 Consumer confidence, large service business confidence, and small business confidence respectively hit their highest levels since 2000, highest since the survey started in 1997, and highest since the survey started in 1974! My lord, that is pretty stunning! Small businesses are absolutely loving Trump. And Trump knows how to party. 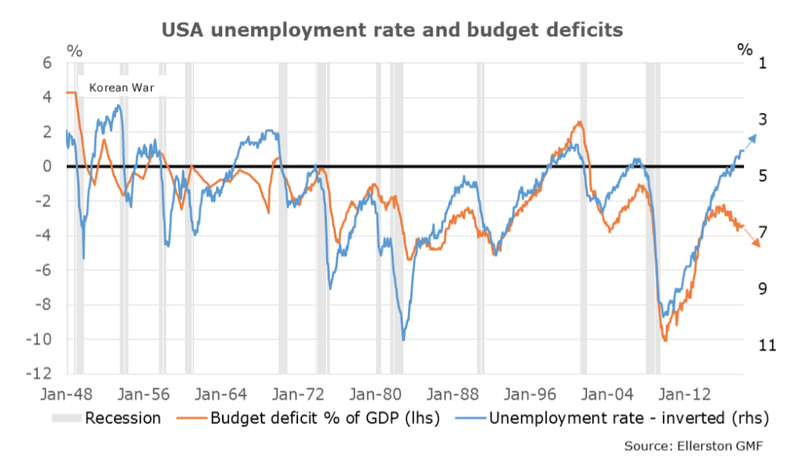 He is pouring more vodka into the William McChesney Martin’s proverbial punch bowl, with his unprecedented good time fiscal stimulus just hitting the economy now. So what happens now? Well, this last month there were signs the Fed is getting concerned. It started with Lael Brainard. Was followed by Evans. And all importantly Powell. Part of this concern emanates from the Fed’s estimate of the short term neutral real cash rate, or r*. Their new estimate jumped close to 1% in August (red line below). So in July they believed the short term neutral cash rate was about 2.25% (2% inflation plus 0.2% real rate). Suddenly their calculations suggest it is about 3%. Whoops. Why the change? Simply put, because the calculation of the short term r* relies on feedback from the economy. If the economy is stronger than expected, the cash rate must be further away from neutral, ergo neutral is higher. Using r* was a neat way of justifying a low cash rate when growth was subdued. But as growth accelerates, the estimate moves sharply higher. Indeed, were inflation to move to 2.4%, and unemployment to 3.4%, the short neutral rate skyrockets. 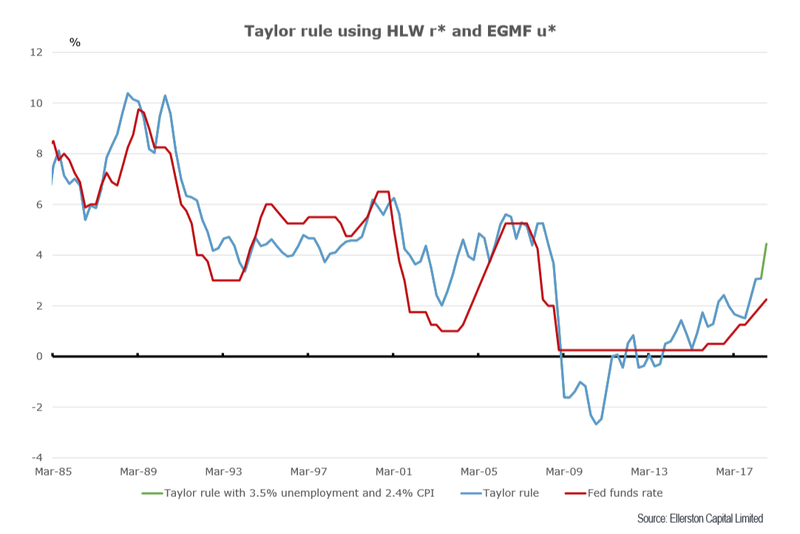 Tim has constructed a Taylor rule using the Fed’s calculation for r* and our estimate of NAIRU (u*). A little bit of growth and inflation overshoot quickly suggests a 4.5% cash rate. Brainard’s speech focussed on how quickly the short term measure is rising. Powell has chosen to downplay the message from r* now (the cynic might suggest now that it does not suit his desire), and focus on the real time message from the data. He lauds Greenspan’s approach in 1996-97. Personally I think that will come back to bite him (hard) as well. He should be looking to Greenspan in 1994. Why? Well let’s consider the 96/97 analogue. The economy was strong. Policy was already restrictive. Inflation was contained. And productivity was trending higher. 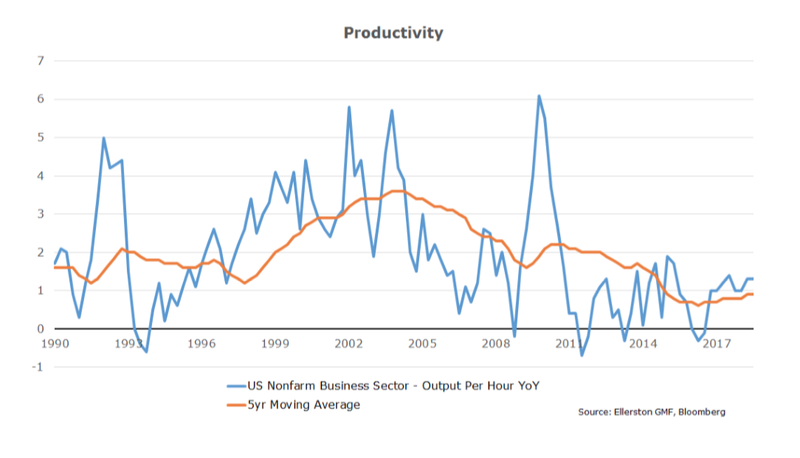 Greenspan correctly identified that the trend pick up in productivity was going to continue, driven by the internet. 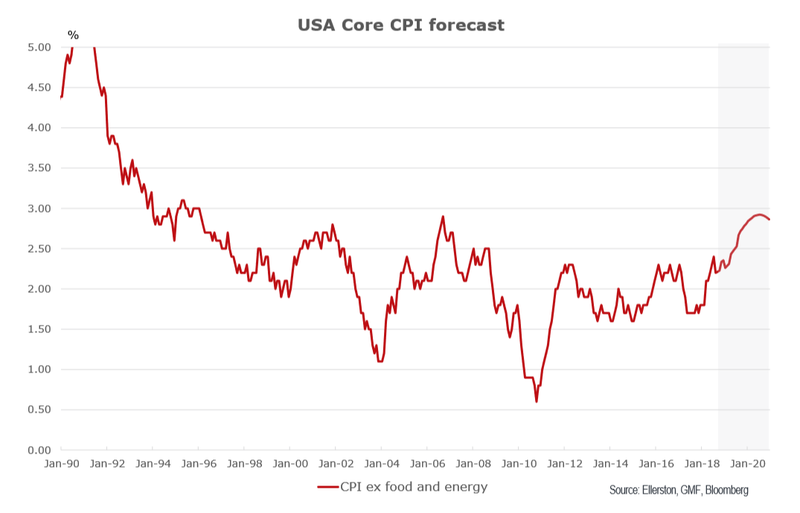 This meant potential growth was higher, and the economy could grow faster without generating inflation. But is now like 96/97? Well no. Firstly, productivity is not trending higher. It may, but it isn’t now. Secondly, policy is accommodative, perhaps very accommodative. So it is a much more dangerous time to “experiment”. In actual fact, it is more like 1994. Growth is accelerating. In February 1994, when Greenspan started hiking, he thought NAIRU was about 6.5%. In May 1994, unemployment fell 0.3% in a single month, to 6.1%. Greenspan hiked 50 basis points. 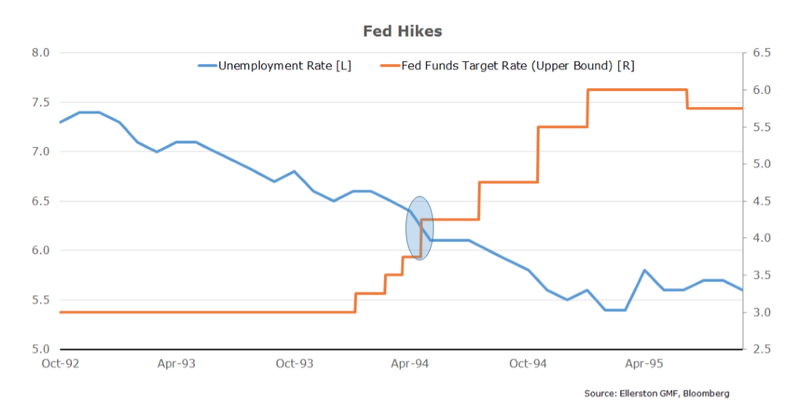 The more unemployment fell through NAIRU, the more aggressive he hiked, with the big 75 pointer in Nov 94. 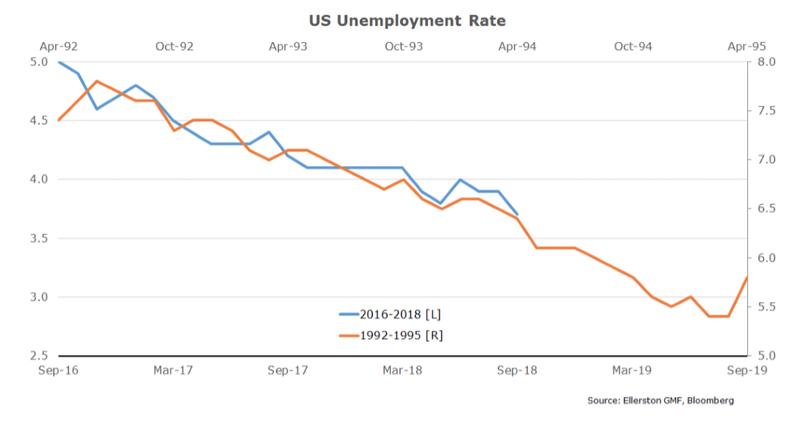 If growth accelerates in the US now, and more particularly in the unemployment rate starts to fall faster than the recent trend, then Powell is challenged. Given the strong momentum in the data, maybe the September print of 3.7% unemployment (lowest since 1969) is the start of the acceleration. Several governors, including Chairman Powell, have become more “hawkish”, reflecting either a conviction that neutral is higher, or the economy is stronger and policy will clearly have to move restrictive. Or both. Of course there are other factors that we have been talking about for the last year. The ECB has commenced tapering – halving its purchases of bonds from 60b a month to 30b a month in October. And the tax changes that encouraged corporates to purchase bonds ahead of September 15th has now passed. Bear market moves in bonds are notoriously quick. Typically a capitulation trade. But wait. “The market has record short positions” I hear your say. Look at the CFTC positioning data. So back to the quick. If positioning isn’t an obstacle, will it be a quick move? What does it take for a quick bear market move? In short, you need a consensus to break. How does that happen? Typically in the face of overwhelming evidence. What could that be? 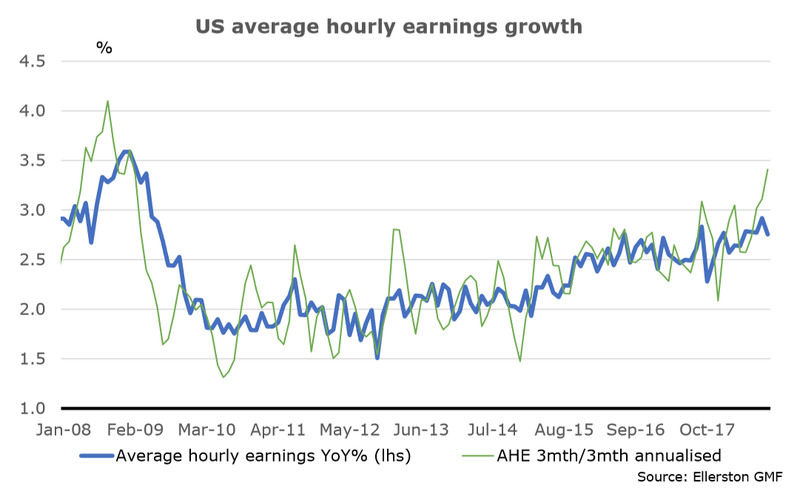 Wages are flashing orange. 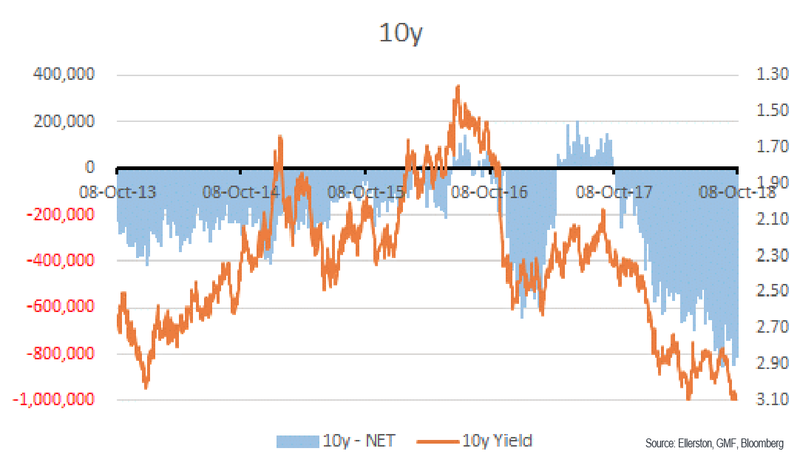 A 0.4 next month would likely push bonds over the edge, with AHE jumping to 3.4% on base effects. We forecast core inflation to rise to 2.5% by June 2019, on its way towards 3% by year end. Not a near term flash point, but it will be a big one as 2.5% is breached in mid-year. And what about the Fed? Well think about this. A hiking cycle of one 25 point hike every 3 months is half the speed of the slowest ever hiking cycle the Fed has ever conducted. When a central bank changes pace, the market reaction is usually seismic. Powell has made it very clear he will hike faster if required. I’m not entirely convinced he will, but if it becomes a genuine possibility, watch out. Expect a 50-75 basis point sell-off across the curve in a matter of weeks. So we open our mind to the potential size of the US bond move. 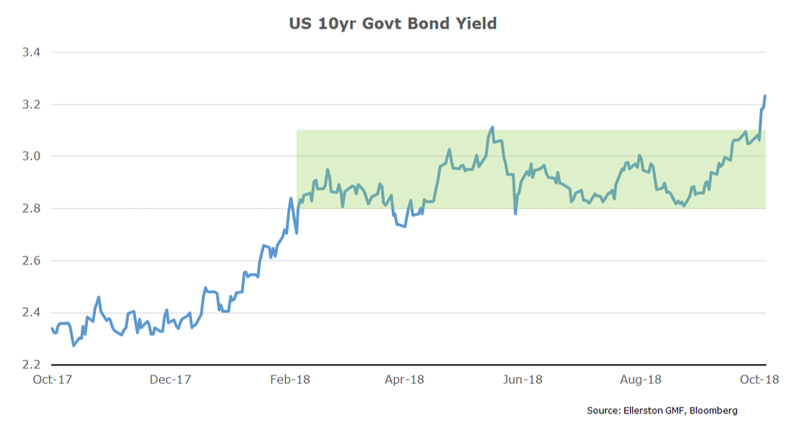 One has to have seen these moves before – an old fashioned bond vigilante, of which there are very few of us left, to understand how quickly the market can break. 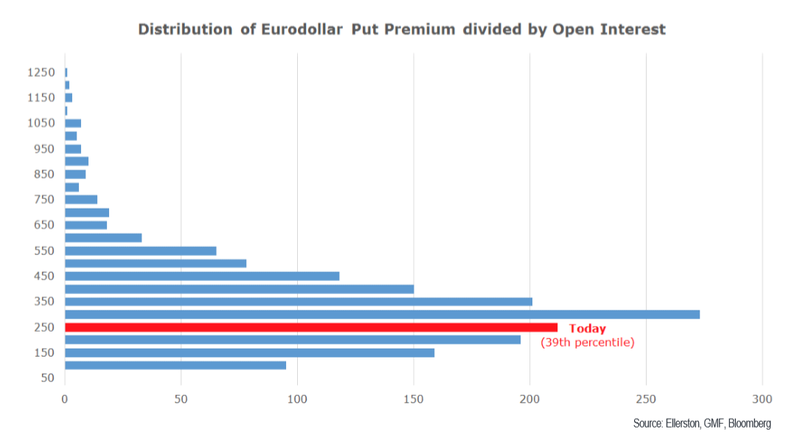 We continue to hold the short bond positions we built in options over the last two months, and this week (October) they have moved in the money. Finally, a word on the war. The tariff war with China and the US. It ain’t getting better. In fact it is quietly escalating into a geo-political cold war. The market has “sold the rumour, bought the fact”, insomuch as equities have rallied since the US imposition of tariffs on 200b of Chinese imports. Some heart was taken from the initial 10% rate, albeit this is slated to rise to 25% on Jan 1. And some heart that China moderated their response, and hence Trump at this stage has not initiated the threatened “Phase 3” tariffs. But make no mistake. Trump is turning up the pressure. The move to sanction China for buying weapons from Russia, and the rapprochement in Mike Pence’s speech at the Hudson Institute (Oct 5th), has alienated China. And it is not clear what China can offer to placate Trump. Nonetheless, with the mid-term elections looming in early November, Trump has opted to play it a little safe on tariffs. We still expect escalation following the midterms, and still hold our exposure to a weaker Chinese currency. The Ellerston Global Macro Fund is an absolute, unconstrained strategy investing in a number of fundamentally derived core themes, optimised via trade expression and portfolio construction across Fixed Income, Foreign Exchange, Equity & Commodities. It focuses on capital preservation while providing low to negative correlation to traditional asset classes. Find out more. Appreciate the depth and thought. Some interesting points however, It's hard to continue to read an article when charts, especially longer term, are reported linearly.